Argentina's first bus rapid transit system is estimated to serve 100,000 daily riders. Photo by Mauricio Macri. 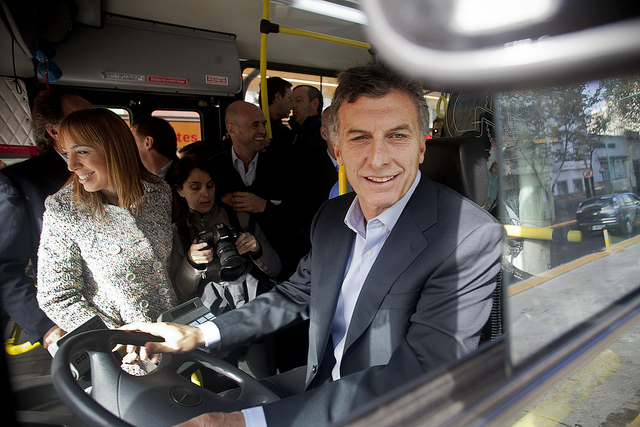 Mauricio Macri, the mayor of Buenos Aires, inaugurated Argentina’s first bus rapid transit system today, marking its first day of operation. The system’s fruition is the result of a collaboration between the Institute for Transportation and Development Policy (ITDP), the W.J. Clinton Foundation, and the city of Buenos Aires. Government officials and the public witnessed Macri introduce the 12km (7.5 miles) corridor and speak of the tremendous impact this transit system will have in improving people’s lives. Titled “Metrobús,” the BRT system has 21 stations and physically separated lanes that run in the middle of the street. As an extra safety measure, Argentina’s first BRT has elevated station platforms, and to keep riders informed, each platform features countdown clocks that notify riders of the next arriving bus. The BRT will connect to two commuter rail stations on opposite sides of the city, forming a trip that takes 40% less time than before, ITDP reports. With the addition of the BRT to the city’s transport network, city officials expect the line to grow to an anticipated 100,000 daily riders, a 15 percent increase in ridership. City officials also expect the system to reduce fuel use by buses in the city by 30 percent, and therefore cut carbon emissions and improve air quality.